Mitral valve prolapse is a heart problem involving the mitral valve, which separates the upper and lower chambers of the left side of the heart. In this condition, the valve does not close normally. The mitral valve helps blood on the left side of the heart flow in one direction. It closes to keep blood from moving backwards when the heart beats (contracts). Mitral valve prolapse is the term used when the valve does not close properly. It can be caused by many different things. In most cases, it is harmless. The problem generally does not affect health and most people with the condition are not aware of it. In a small number of cases, the prolapse can cause blood to leak backwards. This is called mitral regurgitation. Mitral valve prolapse often affects thin women who may have minor chest wall deformities, scoliosis, or other disorders. Some forms of mitral valve prolapse seem to be passed down through families (inherited). 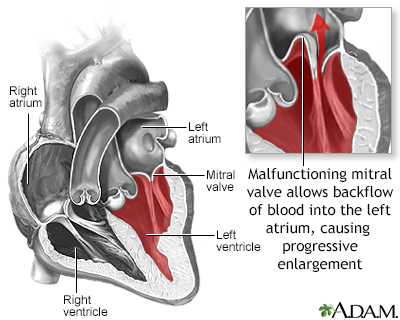 Mitral valve prolapse is also seen with some connective tissue disorders such as Marfan syndrome and other rare genetic disorders. It is also sometimes seen in isolation in people who are otherwise normal. The exact relationship is between these symptoms and the valve problem is not clear. Some of the findings may be coincidental. When mitral regurgitation occurs, symptoms may be related to the leaking, particularly when severe. The health care provider will perform a physical exam and use a stethoscope to listen to your heart and lungs. The provider may feel a thrill (vibration) over the heart, and hear a heart murmur (midsystolic click). The murmur gets longer and louder when you stand up. Blood pressure is most often normal. Most of the time, there are few or no symptoms and treatment is not needed. In the past, most people with heart valve problems were given antibiotics before dental work or procedures such as colonoscopy to prevent an infection in the heart. However, antibiotics are now used much less often. Check with your provider to see if you need antibiotics. The left ventricle of your heart is enlarged. Your heart function gets worse. Most of the time, mitral valve prolapse is harmless and does not cause symptoms. Symptoms that do occur can be treated and controlled with medicine or surgery. Some abnormal heartbeats (arrhythmias) in people with mitral valve prolapse can be life threatening. If the valve leakage becomes severe, your outlook may be similar to that of people who have mitral regurgitation from any other cause.